As part of the on-going rollout of WGS at PHE, we needed to know the MLST Sequence Type (ST) of the completed Salmonella reference genomes. However, this info was not that easy to come across either in the literature or the Salmonella MLSTdb. I deteremined the ST of these genomes by converting the completed sequence to paired fastqs using pIRS, the running the fastqs through an MLST pipeline developed at PHE, which is based on SRST. 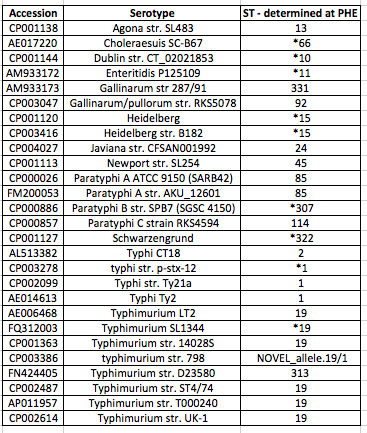 Table 1: the ST of Salmonella enterica reference genomes, determined using a PHE pipeline based on SRST. Asterix denotes a single locus variant. Unfortunately, the insert table plugin for wordpress doesn’t seem to be working, so here is a tab separated text version of the above. Not as easy on the eye but copy/paste-able and google-able.